It's been a few days since my last blog posting, too long in fact. I'm working on the second "Crossing" retrospective piece which should be out this week, and the seventh and final Firestorm article's right around the corner, too. I've also got plenty of convention sketches to plow through, and I'm conducting an interview this week that I'll be posting soon as I transcribe it. So, while I don't really have the time to grab some screen shots of a DVD or something, and I still haven't seen the "Thor" film, I've gotta talk about something. How about we discuss why I read the comics I do? No real in-depth reasons here--a sentence or three, no more. Keep in mind, these are the regular titles that I follow (no miniseries). In alphabetical order, away we go! Amazing Spider-Man - I've been entranced with the direction of the title since "Brand New Day," and with Dan Slott as sole writer, the series has seldom been on more solid footing. A great sense of humor and a terrific understanding of who Spidey is makes this book nearly atop my monthly list. Avengers - I admit I'm not Bendis' biggest fan, but I've always liked John Romita Jr.'s artwork. Right now, the presence of Red Hulk is keeping me on board as the stories have been lackluster. We'll see how future stories go. Avengers Academy - Christos Gage is telling some interesting "young Avengers"-type stories, picking up where he and Dan Slott left Avengers: The Initiative. With "Fear Itself" crossing into the book, I'm not sure if I'll stick around. We'll see. Batman Incorporated - Grant Morrison rekindled my interest in Batman. I was reading in hardcovers, but when Bruce Wayne returned, I couldn't resist. Favorite artists Yanick Paquette and Chris Burnham solidify this book on my monthly pull. Captain America - Ed Brubaker is the spiritual successor to Steve Englehart and shows no signs of slowing down. I've loved Bucky's journey, and will continue with the Brubaker/McNiven Cap series, although I'm not sure about the Captain America & Bucky series that takes over the current title's numbering. Fallen Angel - I've long enjoyed Peter David's series about the city of Bete Noire since it was at DC before IDW. The series keeps David's trademark sense of humor at a minimum which is a major plus, and artist J.K. Woodward is well deserving of higher recognition. Whenever there's a new installment of this series, I'll be there. FF - Since reading Jonathan Hickman's run on Fantastic Four from the beginning all in one go prior to reading the death of the Human Torch, I've been fascinated by the longterm scope of his vision. Steve Epting's art and Spider-Man as the newest member don't hurt, either. Flash - I've enjoyed the current run, but with the series poised to explode into Flashpoint and a zillion tie-in series, DC's given me the perfect jump-off point, just like they did last year with Green Lantern. Herc - I enjoyed Greg Pak & Fred Van Lente's Incredible Hercules series, so I'm predisposed to check this book out on the strength of that series alone. One issue in, I'm unconvinced, but optimistic. Hulk - Jeff Parker, Gabriel Hardman & Bettie Breitweiser have built up General Ross as Red Hulk more strongly in nine issues than in nearly the whole of Jeph Loeb's tenure. I love these guys and what they've been doing. Incredible Hulks - Honestly? I've never stopped reading the Hulk for 27 years. Have I mentioned Greg Pak is the spiritual successor to Bill Mantlo? Good, solid drama month in and out. 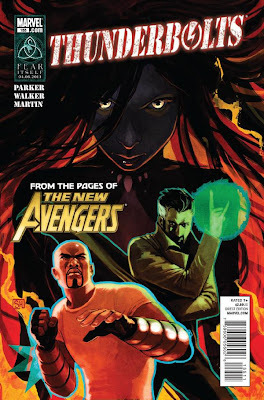 New Avengers - Again, still not a big Bendis fan, but this series I continue reading for Dr. Strange. I'm not overly keen on the "original" team of Avengers we're seeing, though. Savage Dragon - Erik Larsen hasn't let me down since 1993. The book is always entertaining and more happens in one issue than in several of the average Marvel or DC book. Tarot: Witch of the Black Rose - I buy it for the art. Pretty, pretty art by Jim Balent. Thunderbolts - I've picked up this book since #1 back in 1997. Right now, I enjoy the offbeat combination of characters Jeff Parker has assembled, including Man-Thing, Juggernaut, and Satana, all of whom are old favorites. Especially Satana, although everyone keeps getting her costume wrong. Venom - Flash Thompson as protagonist, using the Venom symbiote to fight crime--what's not to love? A terrific premise I'm totally enjoying in action. Zatanna - I love Zatanna when written well, and I love Paul Dini's writing. This series has been excellent from word one. Oh, and I always pick up the following in graphic novel collections: Chew, Fables, Locke & Key, Power Girl, and The Walking Dead. Maybe sometime soon, I'll tell you all about them.